Subject matter aside, what makes this Spotlight special is that it involved Speedhunting in its purest form. 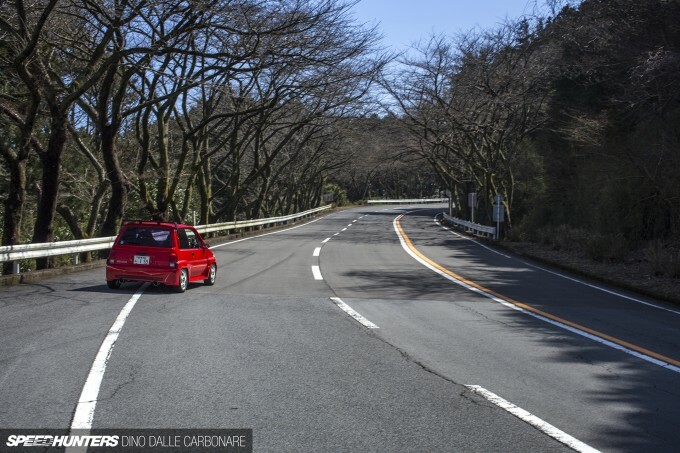 You see, I was attending another shoot at the Hakone Turnpike a couple of days ago when all of a sudden a boxy little car burbled past me and parked up. The owner jumped out and quickly started taking pictures, at which point I realised exactly what I was looking at. The owner has had the ‘Bulldog’ (as the model was also referred to) for about 20 years, and recently had it overhauled and freshened up. Understandably, he has no intention of parting with his little collectable. This City is an 1985 model and originally came out of the Honda factory in black. But after a few too many scuffs over the years it was repainted in this rather vivid shade of red. This is the TV ad that Honda ran in 1984 to market the Bulldog. It was a pretty cool proposition for the day: a frugal city car with menacing looks and decent performance to boot. Simple and to the point! 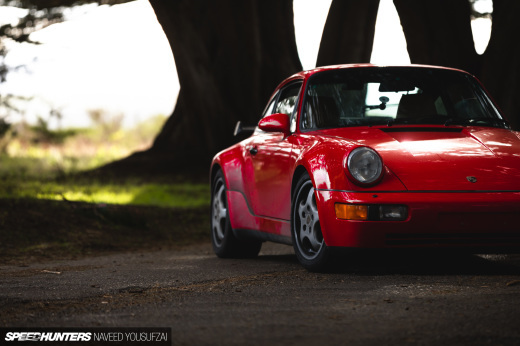 The Turbo II has been fitted with an aero kit, which includes a splitter addition to the front bumper, some side skirts and a pair of spoilers – one on the roof and the other on the hatch above the lights. And what about those super-wide guards? Believe it or not, they’re factory – although the owner has further customised the side intakes, adding a second scoop. ‘Thoroughly accessorised’ would be a good way to describe it! 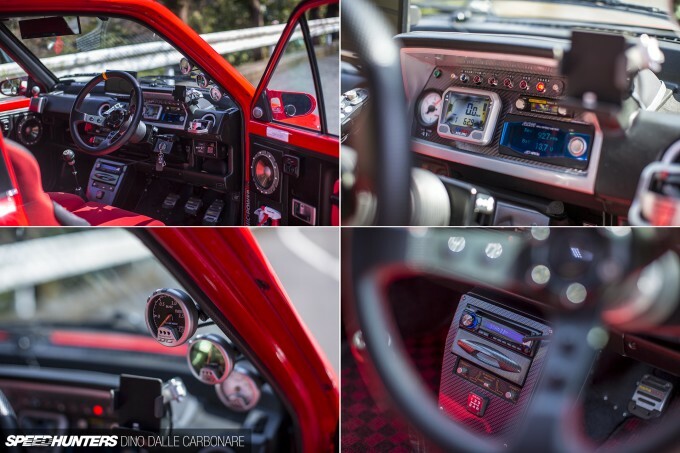 From the custom instrument binnacle to the pillar-mounted gauges and carbon-wrapped center console, there’s a lot going on in this cabin. There’s no Honda Motocompo sitting in the truck area though – just a pair of plastic boxes for the owner’s tools and cleaning products. 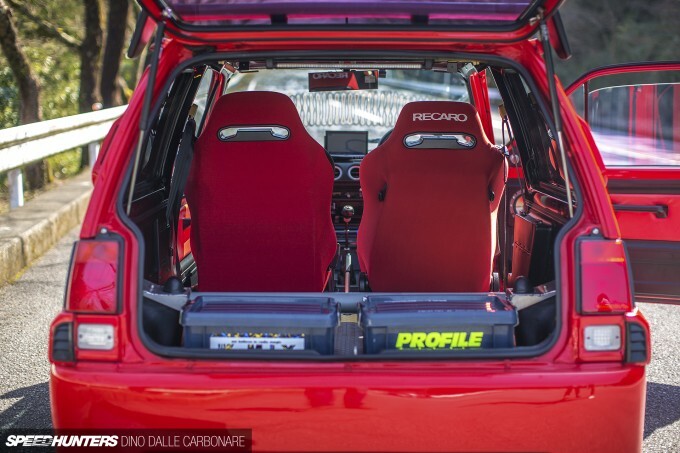 The rear seats have been removed and the fronts replaced with a pair of Recaro items. 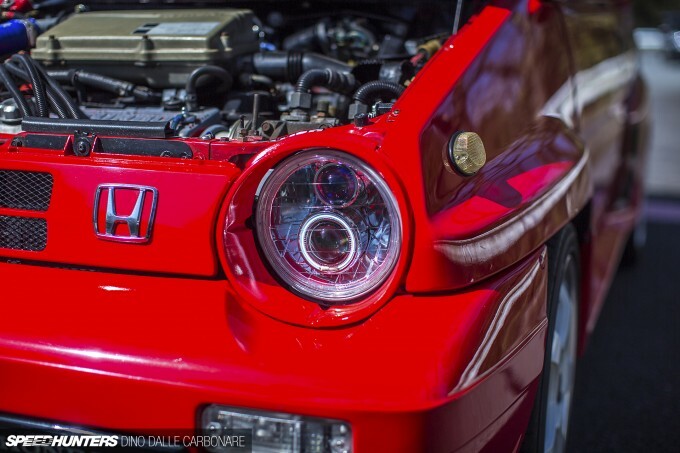 What makes this City model special is that it’s one of the very few turbocharged cars that Honda has produced. Of course, the new Civic Type R is going to change all that now, as even this manufacturer is kissing goodbye to high-revving naturally aspirated engines. The little 1.2-litre four-pot is pretty much stock, save for a few additions that include a bigger intercooler and aluminium piping to replace the softer silicone hoses. Factory power was quoted at 110PS at 5,500rpm, so it might be a little up on that now. Either way, it’s not too bad for a car that hit the scales at 735kg. While I was looking at the engine I noticed that the headlights had been modified and fitted with modern projectors and BMW-esque halos. It’s probably not something the collectors out there would do, but I’m sure the stock lights were far too dull and weak to provide anywhere near decent nighttime illumination. It’s always nice to see unique and rare cars like this one out on the road, but best of all is seeing them being well-used. The owner told me he really only takes the car out to hit the Turnpike and the other tight touge roads that you can access once you’re at the top of the pass. Yes, this is one car that put a smile on my face! Diggin the interior. I wish a company would create a modern take on the sharp, boxy aesthetic of the 80's. With todays technology we could make boxy just as elegant as the organic designs that are so popular these days. Sweet ride though, never heard of one before. Taryn Croucher 80's. What else can be said? Absolutely beautiful photos! Thank you SH for finally bringing some of the rare kei-cars there are out there again! I would love to read more articles featuring Alto's Works, Cappucino, and so on.. Very rare car. Some interesting facts for you. 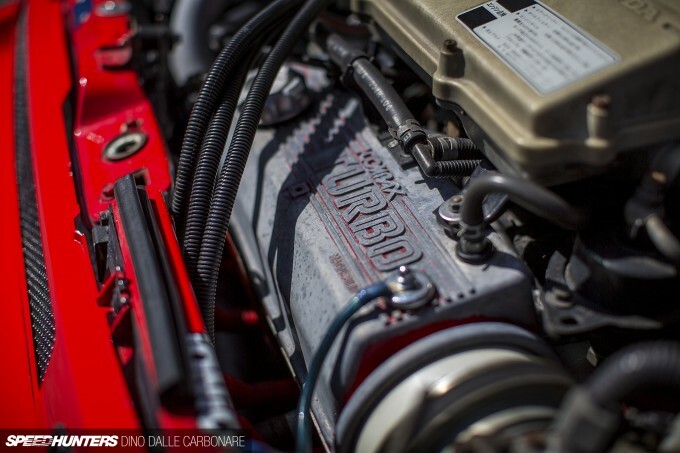 The Turbo II was actually a 1300cc with its engine being based on the old SB engine from the first gen Civic 1200. There was also a one make series of Turbo II R cars produced that where full fledged race cars with much wider flares. After the series was ended all the cars where sold to someone in Australia but they never made it. As they where waiting to be shipped a earthquake destroyed the warehouse they where in. I believe only two still exist with one being the Orange one in Honda"s collection hall. Would like to take for a spin! couldn't stop laughing at the fuji video!Hilarios and very cool feature Dino! Quick question though i was having a dispute with some of my buddies on this. Is touge racing still mainstream thing to do or is a local track day what people aim for now a days there? wicked little car, it must be great fun to drive. Hopefully Nissan will make something like the IDx a reality, and other firms will follow. The market is there for a true budget oriented small cc turbo sport sedan. Not something that's $30k, something $10k less. @Mr Two Benalada You're a shed!?! Awesome article Dino, that car just looks like the definition of fun. That video is from Suzuka. Can u give more details abt the interior?? 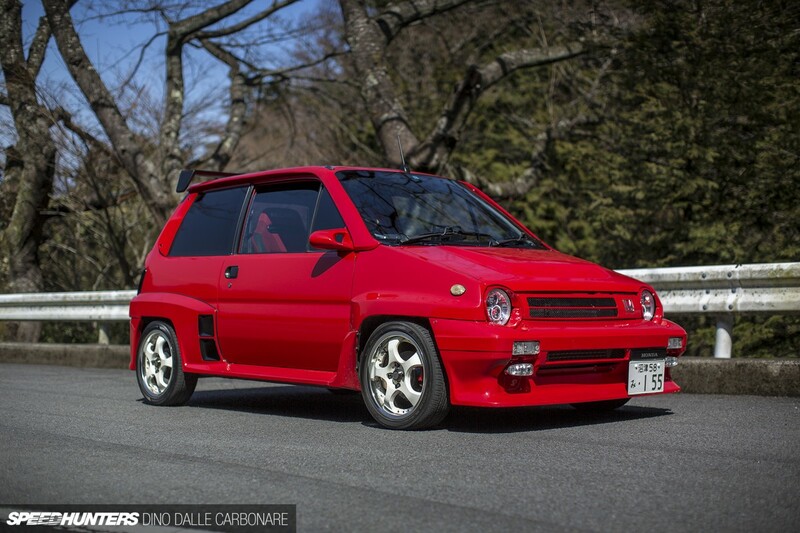 Sorry to correct you but this is legally not a kai car, when produced the cc limit was 550. honda made the city size wise to the regulations but fitted from beginning the 1200 and later 1300 with turbo/turbo+intercooler to appeal to a higher class market. Only a few jeans later they decided to reenter the kai market with the car called "today"
please sh, more kai cars!!! Bahahaha OMG! My friend's girlfriend had this car. I believe he took it out and put in a VVC Boost controller and was stomping the local RX-7's out until it blew up. Oh the memories. I think the Honda city also came with a free elusive Montra scooter for a while too. 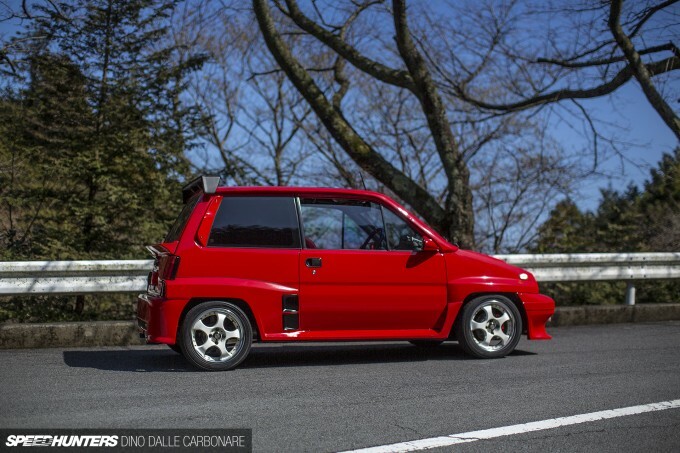 This was Honda's last turbo car for quite a while. 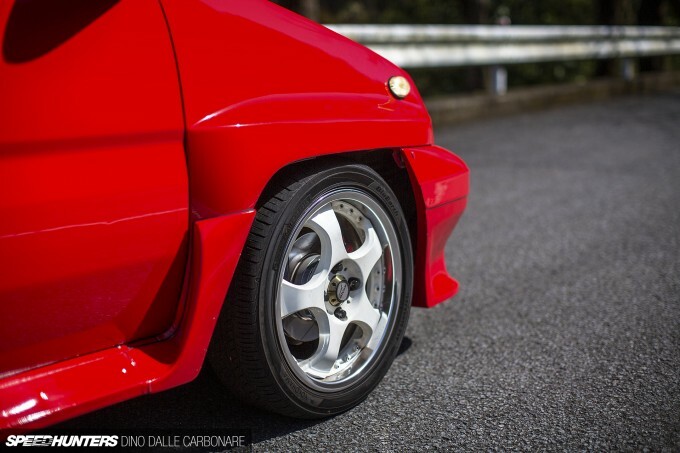 speedhunters_dino Taryn Croucher The 80s. When high tech was magic and the future was going to be awesome. Having been a kid in that decade and growing up watching anime, I can say that for me, the future will always have a Hair Metal and J-Pop soundtrack. My parents had one of these when I was very young, in dark blue but I highly doubt it was the turbo'd version. What an intense little machine! Watching the video, those cars must be around 750kg so less, no wonder they turn turtle after being hit by another car. John Key NZ Did it have the overfenders? The Ghost 1396 Like what? jacobherman14 It still goes one all the time, but it's not "racing" it's just car guys having fun. The ad is hilarious,the 80s were so cult lol. speedhunters_dino John Key NZ The Turbo I version was relatively common in NZ, but it didn't have the widened fenders and aggressive body kit. There are quite a few Turbo IIs floating around NZ too, well at least there were a few years ago. A couple of guys have spent some serious money on the engine side, as the engines can handle stupid amounts of boost from memory. You are right, but I am speaking of pre 1990. They changed regulations then from 550 cc to 660 cc and gone up in size a few couple of centimetre. The city, in its original format was in the size regulations, well except the engine of course. I don't know about the width of the bodykit on the turbo's though. My main sources are the Wikipedia articles, in English and German, about the city, the today and the kei car regulation in general. If stateside, I am game! I heard of hot-k and a thriving kei-car grassroots racing and kei-trucks drifting scene, can't you do an event feature? 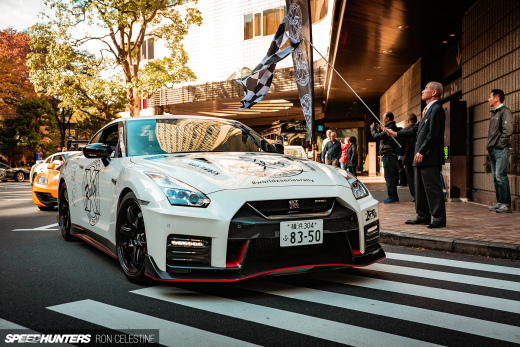 Peter_Kelly speedhunters_dino John Key NZ Nah it was quite a tame version IIRC. Fun vehicle, but my parents upgraded to an Accord, and I split my time between that and my grandparents yellow Cortina... anyway that engine bay. To the untrained eye (such as mine, and I'm used to drooling over 70s vehicle's shaved engine bays) that looks pretty jam-packed, I want to think it is hard to work on given the lack of space but then again it is a Honda and shouldn't be too difficult to access components... and they fitted a turbo in *that*. ryukyustriker No, there were a lot of force inducted K-cars produced after the City Turbo. And for European market Honda produce diesel engines with turbochargers. lol it amazes me how you had thinking like this is the 80's and now civics are as big as accords...willing to bet good $$ if they remade this car to todays regulations with the same size/weight they couldnt make em fast enough....lol and that vid though roflmao!! TheDude69 You should get a Nissan Pulsar GT-IR. Nissan's attempt to enter the rally world. This is a 4WD hatchback with a SR20 turbo charged engine. The engine by the way is better then the SR20 you'd find in a 180SX or Silvia. Better reinforced parts and better turbo. speedhunters_dino zackspeed333 Okay maybe i am thinking of something else but I could have sworn the engine's where 1256cc. I do know that all the parts are interchangeable with the SB blocks. 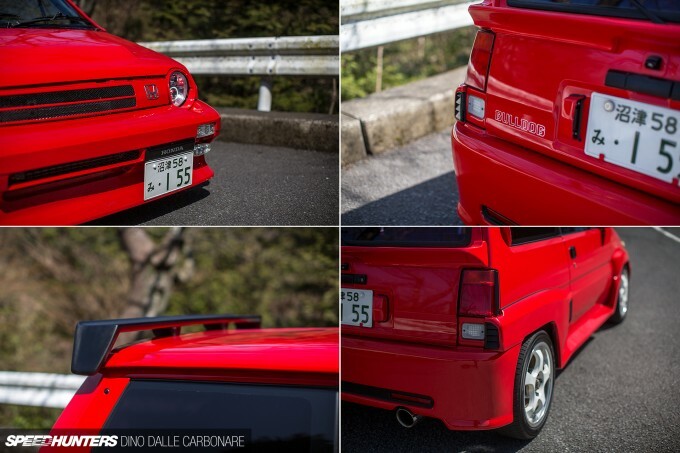 honda city with ganadors and red paint!?!?! need this in my life! Hey Dino the next time you're in Malaysia look me up, sorting out a daily driver city turbo II at the moment, though finding parts here is incredibly tricky.